May 27: Ju Ju at Capitol Hill Montessori at Logan — Teach the Beat! 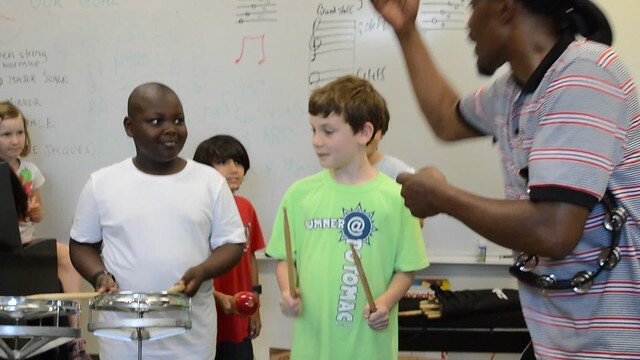 Third-grade students in Mr. Strother’s music class at Capitol Hill Montessori at Logan (DCPS) got a special treat on May 27, when go-go legend Ju Ju came to give a lesson. Ju Ju asked the students about their favorite musicians, then coached the students as teams of four on the rototoms, conga, cowbell, and tambourine. Students competed to see who had the tightest band and quickly discovered that in order to succeed, they needed to listen to each other and work together as a team. Ju Ju had the students copy his beats in their seats and in front of the class. The visit was funded by Office of the Chief of Schools of DCPS.